Yep it is that time again, and to tie in with Computex, AMD are launching the 1.4 TBird and the Duron 950. The Duron 950 really comes as no suprise to us, as this is a common step for the Duron core. As we say every time, AMD have done very well to pull the market around and ever since the launch of the Slot A Athlon they have dominated the market and have left Intel worrying. I personally didn’t move to AMD until I got an Athlon as I was an Intel user. Since then I haven’t looked back. My home system is even an AMD based unit. Intel tried to catch up with the pushing of the Celeron 2 which I haven’t seen much lust or need for within the market. With the pushing of the CPU Bus speed to 100 MHz on the Celeron 2 still didn’t increase performance *that* much. Some people have said that there hasn't been anything due in the future which will have the hype of the P2s, or Athlon. But I think this is wrong, with the introduction of the desktop Palomino this should enable faster speeds, and also the performance of a high end server (2P and 760MP platforms) we should see even more performance. I personally would hold off upgrading for the next few months. AMD have always been competitive on price, and I believe that they are dedicated to making sure that Intel will always be the expensive partner. The main issue that AMD have to overcome is that most companies will only go with Intel chipsets. Don't ask me why, but that's the way it is. With the release of the Athlon 4 in the mobile market and the porting of the KT133A chipset to a laptop interface AMD has a good position to abuse this point in the market. As we have already shown and as a lot of you out there know, the Duron is an amazing CPU. Its primary aim is for performance and value for the home desktop user. It is for budget not for POWER. But this is somewhat a different schema to what AMD have done. So AMD have released another speed increment to enable the user to have this unforseen power. While AMD has a good end number of end users and mostly they sell to the end user directly either via mail order or retail outlets, they currently don't have lots of OEMS on their side. But this seems to be changing rapidly. Especially with the recent release of the AMD 760MP (2P) based platforms. And the release of the mobile range, both of which appear to be adopted by many OEMS and system builders. So why hasn't it taken off as well as Intel? Well Intel firstly have the blue men running all over the place, and also the noise, the "dum dee dee dum". This is something which users hear on the radio or the TV and it sticks. I personally don’t see why AMD CPUS haven’t been adopted by so many OEMS as if you look at the performance it beats it all over, forget about the price, this unit is powerful. So what does the 950 offer which no other CPU offers on the market? Well this is hard to say... Technically it is just a speed increase, or is it just another nail in the Intel coffin? From this graph you can see in the FPU results the 950 Duron is giving a good battle against the 900 Thunderbird and beating all of the other Intel CPUS! Again we see the 950MHz Duron putting up a good fight. This unit is an exceptional budget CPU. So what? Yep I can hear you saying that. Well in the next 6 months we will see a lot of changes. With the ending of the Duron and the TBird, and replacement of them by the Morgan and the Palomino, which will move in to 2P and also in to Desktop and mobile ranges. This will have a large effect on the market, especially with companies such as Epox, ABit, and MSI working on a budget version of the 760MP board. AMD know that their cores run hot at the moment, but with the introduction of the new cores which should run 20% cooler, and the Palomino not even needing a fan on the heatsink, this will make a big difference! So far what we can say is that this new speed for the Duron yet again shows it is a cost effective price for a performance unit. It is a good speed and it is well worth upgrading to even for the people running 700 Durons who should consider the jump to this new unit. It is perfect for the market AMD have developed it for. they don’t work like Intel with "disabling features on a product", they just built a budget unit. It is built for the demand within the market. 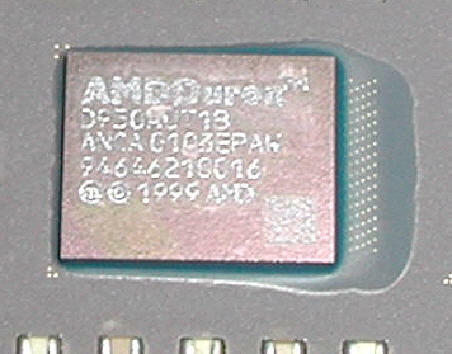 AMD only produce chipsets to launch there products on the market, and it is very dependant on other companies to develop and release chipsets and support them. This means that the market could be affected by the quality or performance of these chipsets. They are totally reliant on VIA, ALi, and SiS. The main differences between the Athlon and the Duron are that the 60% cache on the Duron means that it needs more memory bandwidth to increase its performance. Data that the CPU doesn’t have within L1 or L2 has to be seeked from the main memory this means that this memory needs to be high bandwidth and performance or the system will slow down in speed, as it has to idle whilst waiting for this information. But until the launch of the Kt133E chipset from VIA the memory performance on any platform designated for the Duron was poor and less than adequate. If you aren’t after a total budget system with integrated video and audio, but you cant afford the high costs of the Thunderbird core, this CPU coupled with a KT133/A chipset is a sure power house. It is a good buy for anyone.